Research suggests that all children with Down syndrome experience impaired vision to varying degrees. Early detection, treatment and effective support are vital to minimize the impact of poor eyesight on development and learning. Teachers and parents should be aware of adaptations that can help children with Down syndrome see more clearly. There are a number of aspects of vision which influence how well we see and are evaluated in a full assessment of a child's vision. These include the ability to see objects over a range of distances (a school child with normal vision can see objects clearly from 7cm to far distance - this changes with age and typically older eyes are not so good at near distances so reading glasses are needed). If a child has difficulty seeing close up but can see at distance they are longsighted (hyperopia) and if they see well close up but not at distance then they are short-sighted (myopia). Another focusing error caused by eye shape is astigmatism. These are called refractive errors and can be largely corrected with spectacles. Research indicates that some 50%-80% of children with Down syndrome have refractive errors but the rate varies in different ethnic populations and tends to increase with age during school years. In infancy their vision is not different from other children. However, many typically developing children who have early refractive errors improve over time without treatment during the preschool years as natural changes take place in the dimensions of the eye (the process of emmetropisation). This process does not seem to take place in the same way for children with Down syndrome. [1,2] It is therefore recommended that refractive errors should be corrected with spectacles earlier than usual and that many children with Down syndrome can benefit from bifocals which may not only correct their vision but also improve it for some children so spectacles are no longer needed. [3, 4] The wearing of bifocals has been shown to improve school progress especially for literacy in a Canadian study. In addition to identifying how well each eye works it is also important to know how well they work together, binocular vision, as it is the information combined from two eyes looking at the same image from slightly different angles that the brain uses to judge distances (depth perception or stereopsis). Poor depth perception could affect many aspects of a child's life and physical activities including their confidence in using stairs and escalators. Children with Down syndrome are more likely to experience the eye movement conditions strabismus (squint) and nystagmus (eye wobble). Both conditions are more common among children with Down syndrome. Up to 42% of children may have strabismus and again rates increase with age. It can be treated with spectacles. Strabismus can impair depth perception but does not always do so. We have little information on the depth perception of children with Down syndrome, but one study indicates that 44% of the children with strabismus demonstrated stereopsis and as the tests are difficult probably the percentage is higher which is encouraging. [ 9] One small study of adults with Down syndrome indicates that they all had impaired depth perception but it is not known if this had been the case for these individuals in childhood or had developed in adult life. There are other eye conditions that are more common in children with Down syndrome including cataracts (affecting the lens of the eye), keratoconus (affecting the cornea of the eye) and blepharitis (inflammation of the eyelids) which need to be diagnosed and treated if they occur. [ 1] It is especially important not to miss cataracts in the new born baby with Down syndrome as 1%-2% will have cataracts and early treatment will improve outcomes. These conditions can occur throughout life. This research has led to guidelines recommending more frequent eye tests for children with Down syndrome from birth as, if untreated, a number of these possible eye problems will interfere with visual development and lead to poorer vision over time. [11,12] One study has demonstrated the benefits of implementing the current guidelines showing children being screened and prescribed spectacles earlier. Some problems (refractive errors, strabismus) can be treated with spectacles and with better frames available most children will learn to wear their spectacles from an early age. Others (visual acuity, contract sensitivity) cannot at present be treated so need to be compensated for especially in the classroom and for close work. 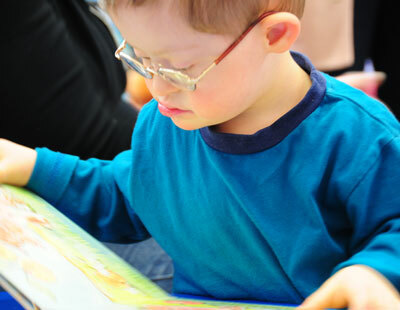 Useful practical information sheets for families and practitioners on adaptations to teaching materials, font sizes and pens from the Cardiff team are available from the UK Down's Syndrome Association. 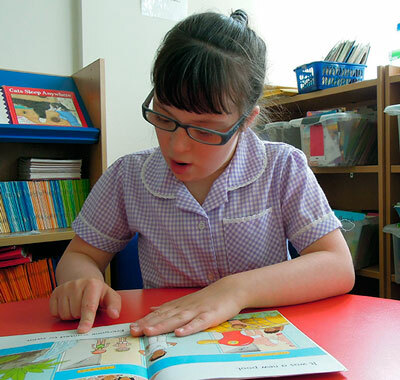 Summaries of the Cardiff team's current studies and published findings can be found on their website plus a helpful glossary of the technical terms used to describe visual impairments and advice on how to get children to wear their spectacles. Cregg, M., Woodhouse, J.M., Stewart, R.E., Pakeman, V.H., Bromham, N.R., Gunter, H.L., Trojanowska, L., Parker, M. & Fraser, W.I. (2003) Development of refractive error and strabismus in children with Down syndrome. Investigative Opthalmology & Visual Science, 44, 1023-1030. Stewart, R.E., Woodhouse, J.M. & Trojanowska, L.D. (2005) In focus: the use of bifocal spectacles with children with Down's syndrome. Opthalmic and Physiological Optics, 25, 514-522. Al-Bagdady, M., Stewart, R.E., Watts, P., Murphy, P.J. & Woodhouse, M.J. (2009) Bifocals and Down syndrome: correction or treatment? Opthalmic and Physiological Optics 29, 416-421. Nandakumar, K. & Leat, S.J. (2010) Bifocals in children with Down syndrome (BiDS) - visual acuity, accommodation and early literacy skills. Acta Opthalomology, 88, e196-e204. Cregg, M., Woodhouse, J.M., Pakeman, V.H., Saunders, K.J., Gunter, H.L., Parker, M., Fraser, W.I. & Sastry, P. (2001) Accommodation and refractive error in children with Down syndrome: cross-sectional and longitudinal studies. Investigative Opthalmology & Visual Science, 42, 55-63. Courage, M.L., Adama, R.J. & Hall, E.J. (1997) Contrast sensitivity in infants and children with Down syndrome. Vision Research, 37, 1545-1555. Krinsky-McHale, S.J., Silverman, W., Gordon, J., Devenny, D.A., Oley, N. & Abramov, I. (2014) Vision deficits in adults with Down syndrome. Journal of Applied Research in Intellectual Disabilities, 27, 247-263.